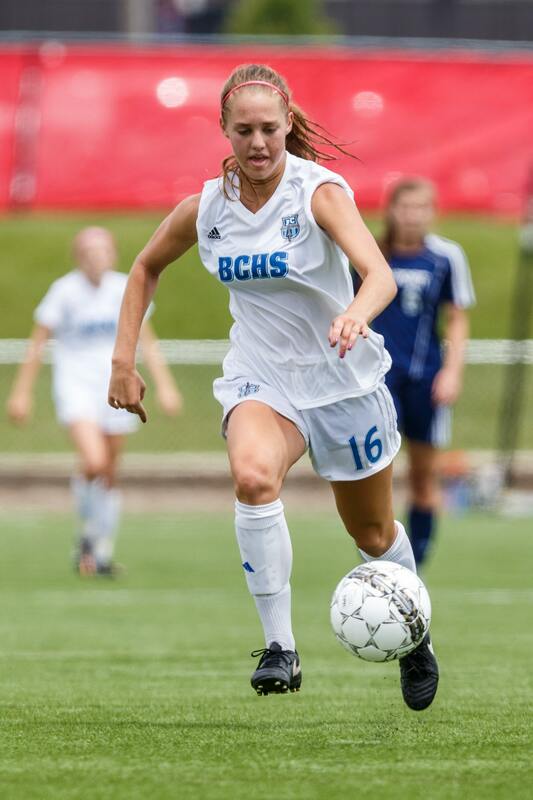 Brookfield Central senior Sarah Knopp didn't like soccer growing up. Three All-Greater Metro Conference honors and one All-State selection later she obviously changed her mind. Knopp is a midfielder on the nationally-ranked Lancers and defending state champions. But her love of soccer took time to develop. "It was my least favorite sport growing up," said Sarah, who started playing when she was 6 years old. "I was really bad (at soccer). I also was in gymnastics, track and volleyball - I loved volleyball and I wanted to stick with that." But then the summer before high school, Knopp got up at 6 a.m. every morning and worked out in her yard. "I practiced everything from touches to volleying against the brick wall. I worked on my moves. I remember I tore up my whole yard." 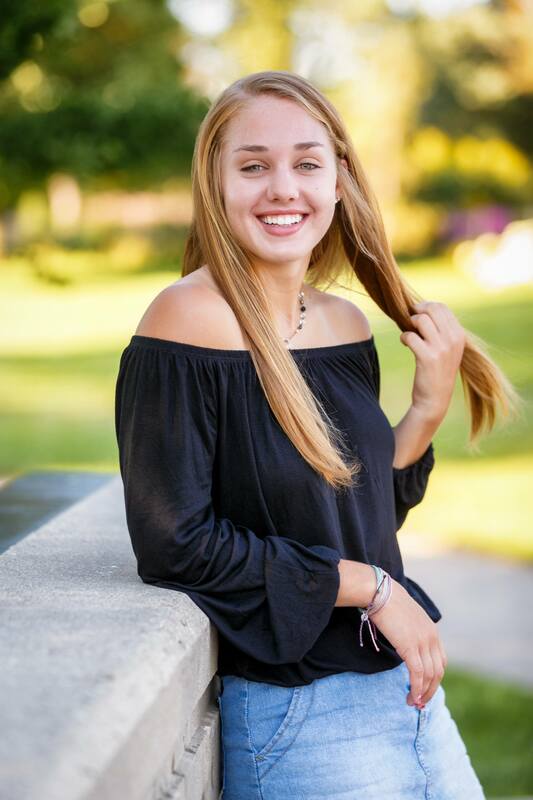 Photo by Alan Herzberg, SportsPhotosLLC --- Senior Sarah Knopp is a 3-time All-Greater Metro Conference selection and a first-team All-State member. "After I started practicing I got better, so it became more enjoyable," she said. "When I was bad, it just wasn't fun. Soccer was more fun when I got to high school." Lancers head coach Dan Makal saw Sarah perform during a soccer camp the summer before her freshman year. "Seeing Sara play was impressive because she could do a lot of things a lot of girls on our (high school) team weren't capable of doing," Makal said. "We knew her freshman year she was going to be really good. She showed up at all the open gyms and was dominant in open gyms. "Watching her play, I thought we could actually change some stuff that we do. There would be a learning curve because to take that many freshmen (Emma Staszkiewicz, Brandi Thomsen were also in the class, among others) at a school like this ... having them at such an early age and change what the long-term perspective was going to be … we figured we could do different stuff. So having players with really good ability, who knew how to play the game, plus their technical work was really good and we could change some of the things we could do." The Lancers, who are 7-0 this year through May 1, are 47-5-8 in Knopp's time at Central. They were 15-2-2 in 2017, 15-0-3 in 2016 and 10-3-3 in 2015. In conference play, they finished co-champs with Divine Savior Holy Angels (5-1-1) her freshman and sophomore years (6-0-1). Then they won the conference title in her junior years (6-0-1), giving the Lancers a 17-1-3 GMC record in her three years on the varsity. They then outscored their post-season foes, 18-0, to win the state title last spring, their first since 2005. Sarah talked about her key role with the Lancers. "I get the ball from the defenders and either distribute or switch the field," she said. "I play dangerously and see the attackers. My role in general is fun, but when you have talent like I have playing next to me, you look better, it makes the whole team look better. We're successful, which makes it even more fun." Thomsen and Knopp were first-team all-state last year and Staszkiewicz was honorable mention last year and first team two years ago, so Makal is blessed with talent. Then there is Jenny Cape, who will be playing at Division 1 University of Iowa. Cape had 3 goals and an assist in the state tournament. This is a very talented senior class. Photo by Alan Herzberg, SportsPhotosLLC --- Sarah Knopp and the Lancers are nationally ranked and No. 1 in Wisconsin. They have a target on their back, but Knopp feels that helps keep them focused. When asked about Knopp's strengths, Makal had an interesting answer. "Her sense of humor - that's paramount," Makal said. "On the field, her work ethic is incredible. I find myself sometimes backing off a little bit because I want to ask her for more just because I know she's capable of giving more. You don't ask that to a lot of kids all the time. "Her ability to lead by being a positive role model all the time. She plays with a lot of intensity. She plays with a lot of knowledge of what should happen and she's always willing to learn. With Staszkiewicz (14 goals, 1 assist, 29 points) and Thomsen (8-5-21) doing most of the scoring, Knopp (5-4-14) is the Lancers main playmaker. "Last year after 10 games, she was leading the state in assists," Makal pointed out. "Yet other girls behind her had played 5-10 more games. She is excellent at distributing the ball." Makal, when asked what Sarah needs to work on, thought a minute before answering. "I would like to see her run the ball back faster," he said. "Also her decision making - get the ball out quicker to a more advance position. I always say (passing) the ball is faster than you can run. Your brain is faster. You think faster and need to see the pass before it happens." Makal talked about Sarah's leadership role. "When Sarah's having a (good) game, she's enjoying herself and it's contagious," he said. "There's a vibe and she gets everybody's clicking. "You can't have everyone be a captain. But if there is a meeting of leadership, Sarah's in that conversation. I don't know how to replace her next year." Sarah shared her thoughts on leadership. "Being a senior you know that all the freshmen, sophomores and younger people are looking up to you, no matter what you do," she said. "You have to set a good example. It's inevitable, you have to be a good leader. You're setting the stage of what the future program will be. It's very important. "And I like to bring a sense of humor, some positivity to this game." Makal agreed with that last statement, when asked about Sarah off the soccer field. "She's a great student, but unpredictable," he laughed. "You never know what will come out of her mouth. Maybe something funny, a joke, but she is usually involved. Maybe putting someone else up to it, but she is always behind it." Knopp needs that sense of humor, because the Lancers have a target on their back every game. "It is a lot of pressure (national ranking), but it's keeps you in the right place (mentally) because each game is a big game, because everyone wants to beat us."